immunity associated with circulating antibodies, in contradistinction to cellular immunity. The inherent range of activity of antibody specificities is wide but proliferation of antigen-specific B cells occurs rapidly during infections leading to rapid increases in antibody titers with enhanced affinity for the inciting agent, and a more effective and directed response. Immunity involving the transformation of B-lymphocytes into plasma cells that produce and secrete antibodies to a specific antigen. a form of immunity mediated by circulating antibodies (immunoglobulins IgA, IgB, and IgM), which coat the antigens and target them for destruction by polymorphonuclear neutrophils. Circulating antibodies are produced by plasma cells of the reticuloendothelial system. The interaction of antibody with antigen also activates the complement system. Compare cellular immunity. See also antigen-antibody reaction. Immunity associated with circulating antibodies, in contradistinction to cellular immunity. The protective activities of antibodies against infection or reinfection by common organisms, e.g., streptococci and staphylococci. 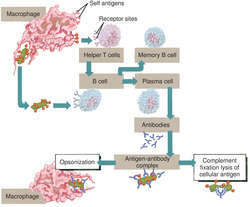 B lymphocytes with receptors to a specific antigen react when they encounter that antigen by producing plasma cells (which produce antigen-specific antibodies) and memory cells (which enable the body to produce these antibodies quickly in the event that the same antigen appears later). B-cell differentiation also is stimulated by interleukin-2 (IL-2) secreted by CD4+ T cells and foreign antigens processed by macrophages. Antibodies produced by plasma B cells, found mainly in the blood, spleen, and lymph nodes, neutralize or destroy antigens in several ways. They kill organisms by activating the complement system; neutralize viruses and toxins released by bacteria; coat the antigen (opsonization) or form an antigen-antibody complex to stimulate phagocytosis; promote antigen clumping (agglutination); and prevent the antigen from adhering to host cells. n a defense system of the immune system, including antibodies and sensitized white cells that are produced to fight specific pathogens. effects carried out via the fluids of the body. thought to be β-endorphins released by the pituitary. immunity based on antibody. See humoral immunity. Humoral immunity is regulated by the production of antibodies against specific antigens (Marasco 1997). Evaluation of humoral immunity of broilers during chronic aflatoxin (50 and 100ppb) and clinoptilolite exposure. N1 may possibly also be a target of humoral immunity, but additional experiments such as Western blot analysis or inhibition of NA activity (26) are needed to clarify this point. The neutrophil: function and regulation in innate and humoral immunity. Low humoral immunity in 6-month-old infants occurred whether they had passive antibodies or not. The serum biochemical metabolites, humoral immunity and counts of Clostridia and coliforms were not affected by dietary supplementation of b-GOS. Furthermore, this ER protect Brucella against not only from host humoral immunity, besides it also preserve bacteria away from host phagocytic mechanism. Cyclophosphamide induced neutropenia and delayed type hypersensitivity assays were performed to evaluate cell mediated immunity while the other two models were used to evaluate the effect of flurbiprofen on humoral immunity. Moreover, secreted IFN[alpha]/[beta] promotes the generation of robust cellular and humoral immunity (10,11). Conclusion and Recommendations: Humoral immunity is a key concept in the proper protection against ND and IBD vaccines. Type 1 interferons potently enhance humoral immunity and can promote isotype switching by stimulating dendritic cells in vivo.